Hairdressers wash, cut, colour, style and treat hair. Discuss client's requirements and analyze their hair and other relevant physical features to define the desired hair style. Shampoo, condition and rinse client's hair with water, liquid soap or other solutions. Cut, trim and shape hair to achieve the desired style, e.g. using scissors, comb, clippers, trimmers and razors. Bleach, colour, perm or straighten hair using various chemical products, and make sure the products are used and stored correctly. Style hair e.g. by combing, brushing, blow-drying, straightening, curling or waving. Provide basic treatment for minor hair and scalp problems. Demonstrate and sell hair care products, and advise clients on hair care. Perform reception duties, e.g. schedule appointments, answer the telephone, order supplies and operate cash register to receive payments. Keep the salon, work station and tools clean and tidy. Keep up-to-date with new products, styles and techniques. 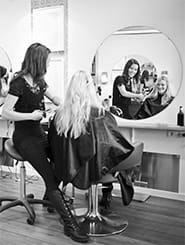 Train and supervise other hairdressers or assistants. Keep abreast of current and future fashion trends, especially in hair styles. Style a person's hair using the appropriate techniques and products. Curl a person's hair using the appropriate techniques and products. Ability to interact effectively with other people. Make recommendations to customers about suitable hair styles, based on their preferences and your own professional judgment.